These are Park Models, which are towed to a location and then permanently planted. They’re closer to a modular home than an RV trailer. I only mention them because you’ll see them in some RV parks. 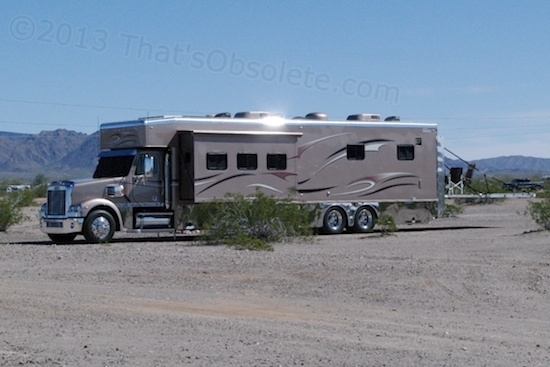 In previous posts, I’ve mentioned just a few of the kinds of RVs that people can be found camping in. It’s probably time to underscore that although getting and using a recreational vehicle may seem to be a monolithic thing – buy something and go camping – the reasons and ways that people spend time in one varies quite a bit. Please note that nothing in this post is based on official data. It’s all just observation and opinion – which sounds nicer than “bias”. Many people get a travel trailer simply to get away from home for several weekends during the summer. They get it out of storage, tow it to a commercial campground – particularly on holiday weekends – and essentially party. Their goal is to find a location they can hook up to for electrical power, water, and sewage, and they use it as a sort of vacation home. Some will forgo storage and simply rent a campsite all year, leaving the camper there. Then, all they have to do is drive to it and move in. 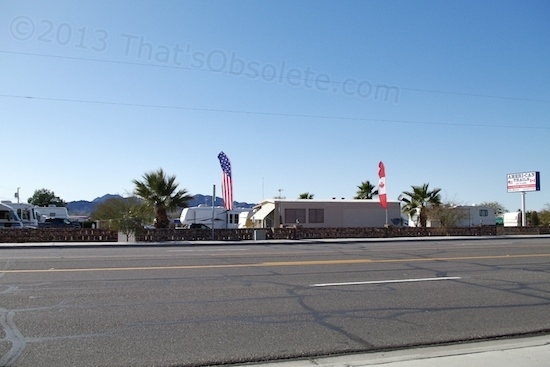 Some RV parks particularly cater to this type of use, offering discounted rates by restricting how many days per month that you may inhabit your RV there. Most trailers used for this are connected to the tow vehicle by a common bumper hitch, which means that the RV can be towed by just about anything that can deal with the trailer’s weight. The cost per use of using an RV this way is obviously quite high. Essentially, the RV becomes just another recreational device, like a boat, ATV, or motorcycle. 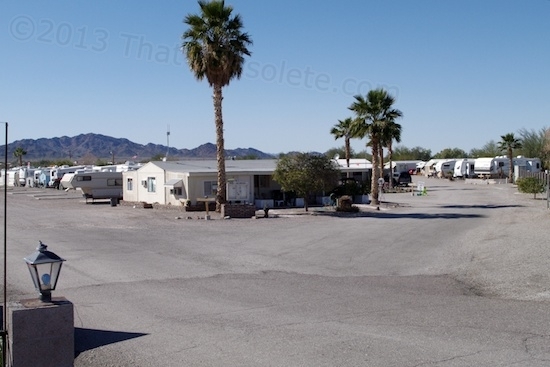 RV parks in Quartzsite offer short and long term stays up to seven months of the year, before the summer heat kicks in. They are quite affordable compared to RV parks in Northern Illinois. Other people prefer to save up vacation time and use their RV to visit areas of the country that they haven’t seen before. To them, the RV becomes more of an adventure source. They may hit a lakefront commercial campsite, or visit a national park, forest, or monument. They’ll most commonly seek out campsites that offer power and other amenities. Many folks just getting their feet wet here will rent an RV which, although brutally expensive to do, is still much less costly than buying, maintaining, and storing one. I’m adding people who have a pop-up trailer (essentially a tent on wheels) to this category, even though they tend to use them only a few days at a time and never go to commercial sites or have hookups to power. I’m doing this because their outlook fits here: the pop-up, like tent camping, is all about adventure and new experiences. This is a wash, not a trail. What does it have to do with this post? You’d never see this if you didn’t camp here. Retired people or business owners will commonly do a variation of this based on time – because they have more time available. They’ll head out for a month or several at a time, going far from home to tour different areas of the country. 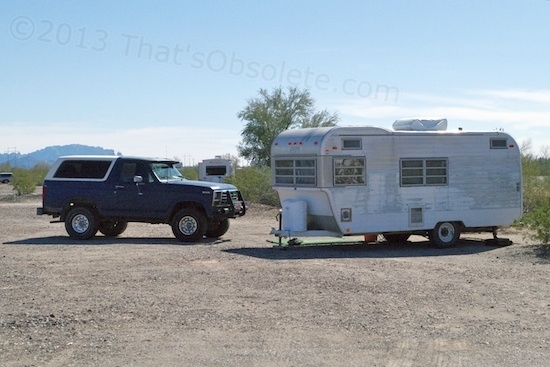 This is a particularly enjoyable way to go RVing, because it’s more immersive. You stop when and where you like, see new things, and aren’t strapped in by the race against time. This is a good reason why selecting an RV type and configuration can be far more important than selecting an RV brand or model. Technically, I might be able to get my older 26″ travel trailer through this shallow dip, but not without some serious frame dragging in 4WD-low range. Might need a shovel, too. Exactly how this is done varies all over the map. The great majority will simply go from one commercial campsite to the next, but mix in a few overnights at campsites without any facilities, too. The RVs most commonly used for this are fifth wheels and motorhomes. Fifth wheels are merely travel trailers that are connected to their pickup truck tow vehicle using a special hitch mounted inside the pickup’s cargo bed, rather than being connected at the rear bumper. The extra expense of hitching this way is offset by having the ability to safely tow a larger, heavier trailer than is possible by using the bumper hitch connection of a common travel trailer. Fifth wheel trailers are also easier to maneuver in confined spaces, because they can offer more living space in a more compact overall length when hitched up. Motorhomes are self-propelled camping vehicles, resembling busses on the outside. A third common RV type is the Toyhauler, which is simply a fifth wheel trailer modified to sacrifice much of its living space for an open bay in the rear for carrying ATVs or motorcycles. Three motorhomes. Tents and canopies offer some relief from cabin fever. Smaller units lean toward tents, while canopies are popular even with the largest motorhomes. Most RVs in this category of usage are able to dry camp or boondock without any connections for significant periods of time by using gas-powered generators that are run for several hours each day to recharge their on-board batteries. 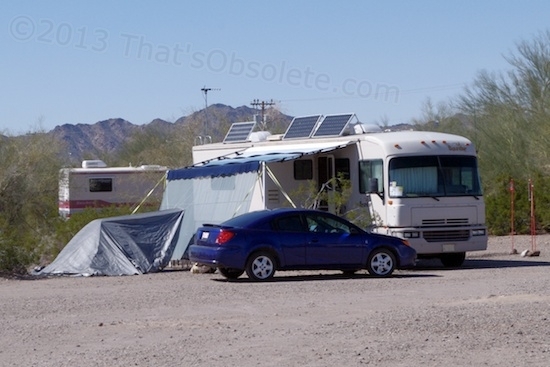 Some people decrease their overall costs this way, avoiding expensive commercial campgrounds whenever possible. With a big enough generator, it’s possible to run microwave ovens and even air conditioners for limited periods of time. Solar power systems are often installed to varying degrees in order to avoid having to use gas generators, which tend to be noisy and wear out when used heavily. The more limited output of solar panels isn’t very adaptable for such high-draw appliances, although specialized appliances do exist and are popular, like low-power microwaves. Not every old trailer is a classic, but this eclectic little unit offers plenty of light and ventilation compared to modern units. More serious RVers from the snow belt will spend up to nine months on the road before heading back home for the summer. They often consider themselves to be full-time RVers, but aren’t really. They’re “Snowbirds”, migrating to stay in more temperate weather. Since most folks are social animals, how much time they spend living in their RV is most commonly limited by how comfortable they feel being away from home and family for extended periods. Many like the lifestyle, but find themselves trimming back after awhile because they get homesick. 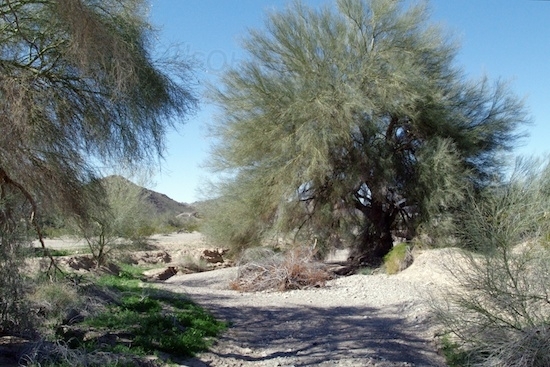 If they use commercial campgrounds much, time away is also limited by finances. Rving can be only a little less expensive than living in motels for one to nine months a year, which means it can be a very expensive lifestyle to maintain. Fold the campsite costs, transport fuel, and vehicle repairs into the costs of owning and maintaining a home, and you quickly discover that you need to be pulling down a pretty hefty income to be able to pull this lifestyle off. 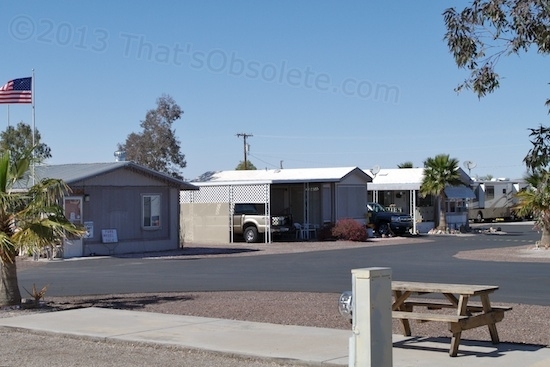 One way retired people trim these expenses slightly is to plant their RV in a commercial park year-round, and simply drive back home every summer. The big plus of dual maintenance for older folks is that if and when illness strikes, they can just go home, winterize the RV against freezing weather, and make the rounds of doctor visits and rest as needed. 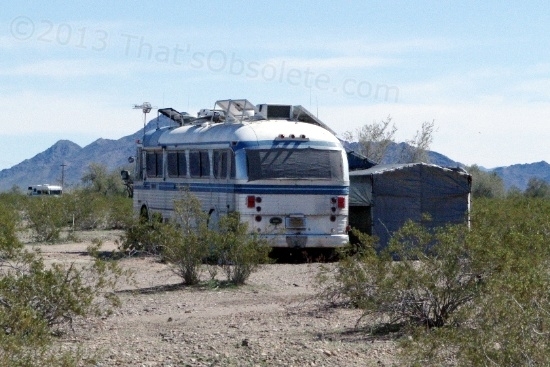 Rving, Daddy Warbucks style. Though less space efficient, truck-based RVs offer years of extra miles and serviceability. Note the spectacularly huge suspended deck folded out on the rear. It probably doubles as a loading ramp. True full-time RVers often maintain a home base too, either because they are still experimenting with full-timing to see how comfortable they are with it, or because they know that they will eventually need to return to “sticks and bricks” after some number of years. The expense of having two homes compels others to choose to go for broke in order to make more money available for living expenses. Many full-timers own nothing more than a rural plot of land they can park and camp on before taking off again. 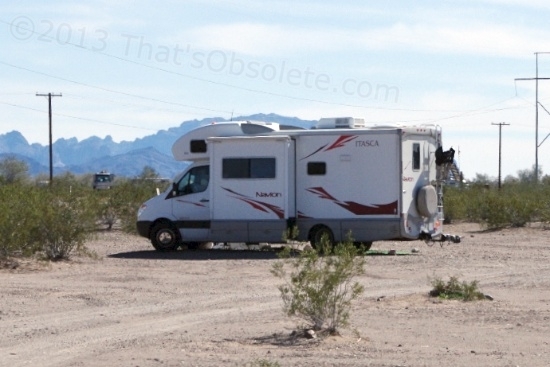 Many more own nothing more than the RV itself, and keep up that lifestyle until circumstances force them off the road. I’ve found two subcategories mixed into this. 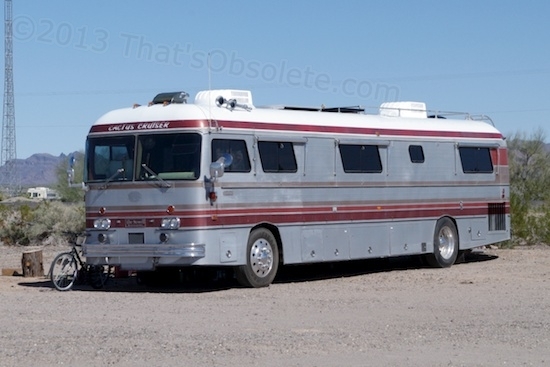 I’m guessing this is an MCI motorhome, not a later conversion. They tend to last because they really are a bus underneath. The first is the traditional full-timer. RV types here run the gamut from small van-based motorhomes to modified box delivery or bread trucks, to $300K luxo motorhomes. Solar power tends to be much more heavily used here, and dry camping is much more common. Most vehicles here are modified for heavy if not total dependence on solar power, and include ways to increase both fresh water and waste capacity. There are limits of course, and power, water and waste conservation techniques are accepted as a kind of personal challenge to see just how long you can go between dump stations. Without conserving water at all, I can go 10-12 days in my rig, limited by waste tank capacity. I might be able to reach three weeks by conserving water, I’m guessing. Some of these folks limit water usage much more, and can double that. Motorhomes based on compact vans are popular because fuel mileage is often better. Wall sections that move out, called slides, offer more interior space, but do add weight, are unreliable over time, and tend to cause leaks. How badly do you want a little more space? In all cases, traditional full-timers are living such a lifestyle by choice, tend to work regularly for income and/or free camping, and have widely varying amounts of disposable income. There are a few full-timers who are doing things like living out of vans and even cars, as a deliberate choice of living an alternate lifestyle. They spend time moving around, but many also tend to stay in urban areas regularly, because of things relating to business, income, and friends. Income tends to run the gamut, from workcamping (arranging to work in public venues like campgrounds, race tracks, or theme parks) to running businesses in retail or services that can be run over the Internet. Some are retired and living off a pension and social security or investment income, while others are relegated to living solely off of Social Security Disability payments. The latter are choosing full-time RVing as a viable alternative to assisted or conventional housing. As a group, full-timers tend to be the most frugal simply because unrestricted full-timing can blow through money faster than any paycheck or investment income can supply. Conserving costs becomes both a personal challenge and a necessity. These setups aren’t all that rare. This is a musician’s rig. A small converted cargo trailer serves as the living and sleeping area. The water system is simply jugs of clean water and either a bucket with a seat, or in this case a Porta-Potty and waste transfer container. The tent and lawn chair offer a change of place and view. Believe it or not, some people are quite content with this setup because they love the outdoors, and it’s well-suited to desert living conditions. Note the satellite antenna, solar panel, and propane tank. The other subcategory of full-timer is being an involuntary full-timer: homeless. I’ll go into this in detail, mainly because this type of homelessness is new to me. Maybe it’ll be new to you. A sizable segment of this group is most commonly found in Southern California because of its moderate weather. Most of these people have been unwillingly forced out of traditional housing by illness, unemployment, or both. Even for young couples, the combination of illness, high rents, and minimum wage service jobs instead of jobs within their backgrounds knocks them out of housing and into a vehicle of some sort. 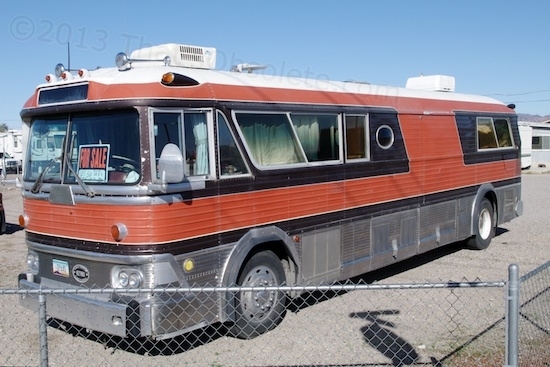 Sometimes, it’s an old used RV. Much more often, it’s their automobile alone. This converted bus has been here as long as I have, and has never moved. They’ve got more solar panel wattage than I do! Let’s see if they move out before I do. As in the Great Depression, these people camp out of their cars, but the locations are now near their jobs in the urban areas, not farm fields. If they still have jobs, they drive to work, and then afterward to some safe location nearby. “Safe” means safe from the police as well as muggers, because the police are charged with enforcing increasing legislation against them. That’s the second reincarnation of the Great Depression. 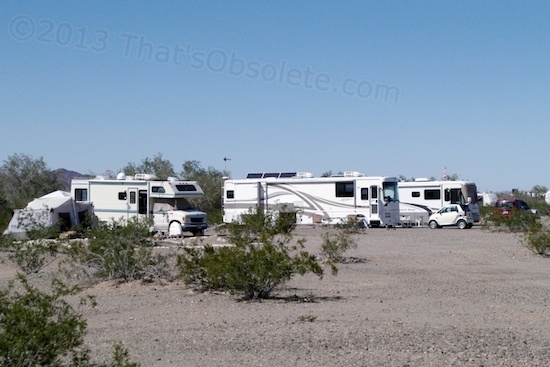 Most everyone wants RVers with disposable income. Nobody wants perceived losers who are unable to overcome hard times for one reason or another. Fortunately, no outraged local gangs are going around beating up Oakies, but the stigma of being ill or persistently unemployed has prompted local and county-wide ordinances throughout California (and Illinois) against the act of sleeping in any kind of vehicle. Offenders are ticketed, and they obviously can’t pay. After a set number of tickets, their transportation is seized and impounded. They obviously can’t pay those fees too, especially when they lose their jobs as a result. I suspect that someone who was an adult through the 1930’s might see such legislation as a ridiculous incursion of liberty and moral decency, but the impact on the social services costs of forcing someone from mobile housing to being on the street and now jobless must be more than pocket change. With and awning out and partition blocking the low sun, these folks are comfy. The tarp on the left is simply shielding equipment from the sun. They even have bird feeders staked in to the ground!?! I think they’ve been doing this awhile. The stereotype of failure because of mental illness, alcoholism, drug addiction or other deserve-what-you-get vice is still held by the still-employed and health-insured public, but the large surge in homeless numbers since the crash belies that. The great majority are simply ordinary, frightened people caught in bad situations, and who are scrambling to avoid the last and final rung down. 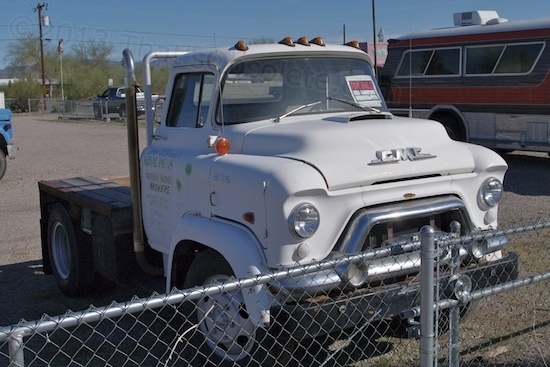 This 1964 MCI is offered at $8500 in Quartzsite, and “runs good”. Probably needs plenty of interior work, I betcha. Overall, I think that the degree to which people get involved in RVing is based on what they expect from it. Occasional weekend getaways near home are one thing. Extended touring is another, and true full-timing is a world away from both. Some dabble and are completely satisfied. Others RV each year and return home only when the money runs out. A few decide to adapt their finances and way of living to make it a real lifestyle for them. People go to commercial parks because they just want to be able to plug in their toys and not worry about tank levels, and they’re willing to pay for the convenience. But, back to the storyline, since the goal of RVing is generally to expand one’s personal horizons and get more out of life to some degree, the depth of involvement is highly individual. Each RVer eventually discovers the limits of their own comfort level with it, and this determines their involvement level. I find myself occasionally drifting toward feeling arrogant about being a full-timer, because there’s a certain satisfaction from learning to make an extremely unfamiliar, relatively minimalist lifestyle work after a lifetime of tight-fisted conventionality. That smugness is then nicely derailed each time I stumble over a full-timer living in a van, or one living out of a small tent and tiny cargo trailer pulled by a car. They serve as a recurring reminder that the adaptations and “sacrifices” I’ve made to live in a 26’ home on wheels are commendable, but nothing to brag about. At its core, I think RVing is about exploring and then balancing one’s own comfort level, with what amounts to literally packing in all the adventure you can stand. Exceed your comfort level, and fear prompts you to retrench. Most touring RVers feel more at ease by retracing familiar paths and developing a routine that provides a sense of stability and predictability. Those that don’t, limit their time on the road and take their comfort from knowing they have a home base waiting for them, complete with family and friends. Some develop friendships on the road, and get all the sense of connection they need from traveling in packs or by monitoring each other’s travels and eventually meeting up at various campsites. Although women RVers tend to miss strong personal connections and familiarity more than men do, it’s not universal. There are more than a few women, both young and old, that are happily camping solo. Predictably, the interiors of whatever they are using to camp in are always far more homey than us slobby solo guys create for ourselves. Surprise. Certain parts of my own new little adventure certainly punched through my personal comfort level, and still do now and then. Things I’d love trying “at home” are much tougher to do comfortably when aid is much harder to come by. Four-wheeling is great fun, but at the same time, you also know that if you ground out and disable your only means of transport while running solo in a remote wildlife preserve, you become aware that the consequences would range from simply having an adventure which includes blowing through all your emergency savings, to discovering just how quickly dehydration can completely disable you in a desolate area miles from help. It’s discomforting when any of the numerous systems in the camper go on the fritz, which they are prone to do now and then. Unlike being at “home”, getting help can be arduous and expensive. Then there are the little surprises, like the giant spider and the visiting yellow ground or bark scorpion which, after a brief pitched battle, succumbed to my shoe. Comfort level is also determined by finances of course. 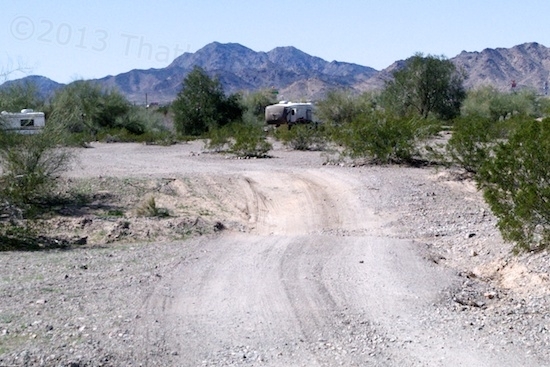 It’s hard to feel stability and predictability within RVing when your money is running out. Just like with a traditional lifestyle, the fix is to either boost income or cut back on expenses. Because of the logistics involved, particularly when dry camping in remote areas to minimize costs, boosting income is often extremely difficult. Expenses are what have to go away then, and you regularly find yourself having to mentally separate wants from needs. This little form of self-reflection tends to do one of two things: it either makes you resent the sacrifices involved, or it gives you a sense of reward and accomplishment at having discovered that some must-have really isn’t essential to your happiness after all. Is living on the road for everyone? No. The vistas are grand, I admit. Great weather, I can adapt to. Having a yard that extends for hundreds of yards around is nice, and so is the quiet beauty. Simply being able to do whatever you like on a whim, without crimping anyone else’s style is nice. The sense of adventure and having controlled amounts of the unknown is rewarding. Discovering my own personal limitations and adapting to a new lifestyle is challenging and rewarding, too. In my case, stepping away from the consumer treadmill and having fewer distractions allows me some quiet contemplation, and more. Just call me Doug Thoreau. “I learned this, at least, by my experiment; that if one advances confidently in the direction of his dreams, and endeavors to live the life which he has imagined, he will meet with a success unexpected in common hours.” – from the “Conclusion” to Walden by Henry David Thoreau. How far along am I in my own journey? Well, I’ve found that I’m a person who isn’t considering collecting spiders or scorpions as a hobby. Definitely off the bucket list. It’s often best to merely live vicariously by following along with the story of someone who is doing what you kind of wish you could do someday. About the last thing I would suggest is to do what I did, and transition from Joe Average to 100% full-time RVer in two months by brute force. Sounds a little crazy anyway, doesn’t it? It’s more in my nature to dabble with things hesitantly, and never make any real changes away from the comfort of “safe” choices, though. I knew that if I ever really wanted to experience different parts of this country, I’d have to take the slash-and-burn approach, and commit. I’d have to lose the familiar, and take some risk for once. Some risk is real, yet most of it is not much of a risk at all, because it’s merely based on unfamiliarity, assumptions, and fear of the unknown. The penalty of risking and failing is sometimes merely discovering that the resulting bad effect is really pretty minor after all. You can get through it, and learn something from it. Net gain. So the motivations for RVing can vary widely, as can the implementations and the style of rigs. There is no “best way” to RV. There is only the way that individually suits you best. As always, relying on a salesman for guidance can result in a very bad fit and some results that will later prove to be unacceptable to you for one reason or another. You need to find out what you really want from it, research all the possibilities that can give that to you, and, most importantly, carefully weed out what your true priorities are. What you think you want at first can change radically once you wander outside of the commonplace to research the very wide range of what others are actually doing, and why. 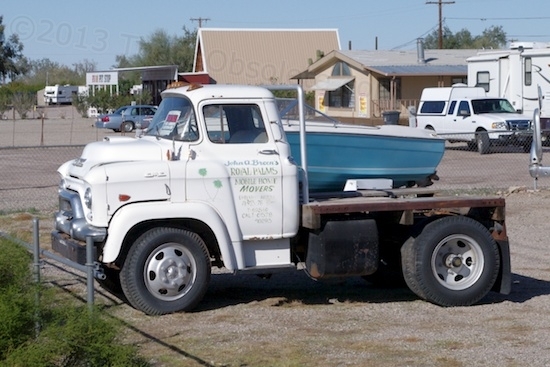 This 1959 GMC LCF-350 was used to tow mobile homes, hence the short bed and wheelbase. Now using a GMC/Chevy 302 V8, I think it has some interesting possibilities. For sale at $950. What a beast! With a face only a mother could love, this thing has two gigantic fuel tanks strapped under the bed, such as it is. What are the floorboards like? I know many people joke about RV people, but I understand you and the concept… I own an old Caravan, and it is still huge fun to go camping! It is fun, and for some individuals, even more fun when pursued full-time as a lifestyle! I was wondering if you have contact information for the truck you posted for sale? I do, Vetteman, but that thing disappeared pretty quickly and I’m sure is no longer available.